Yut: Too bad reheating them is a pain. Me: Well we can eat ’em cold or just stick ’em in the mike! Yut: I don’t think we can reheat eggs in the microwave. Me: Really? Seems like it’d be ok to me. Oops. I WUZ WRONG!!! 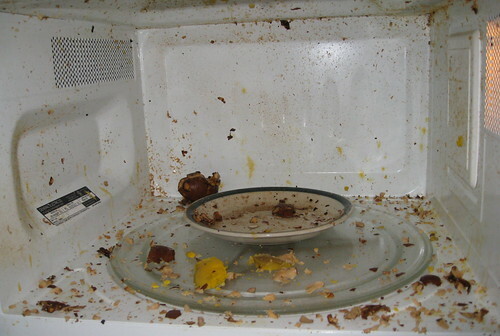 So yeah, don’t try and reheat hard boiled eggs in the microwave. Although maybe it’s cos he didn’t peel the shells off the eggs before sticking them in. I don’t know, and I don’t think we’re gonna try it again! Adapted from Chinese Home Cooking Made Easy by Shyh-Pwu Tien. Actually to be perfectly honest, all the amounts are random, I increased everything the cookbook said, except the eggs and salt, ’cause I like flavors, but it worked out fine. It’s a very forgiving recipe. 1. Place eggs in a pot, cover with cold water, add a little salt (optional), bring to a boil over medium high heat, boil for maybe a minute, then turn off stove and let sit for 10-12 minutes or so. I like to use older eggs for this because it makes the eggs easier to peel when eating — so buy the carton of eggs about a week before you are going to make this. 2. Drain the hot water, rinse under cold water to cool. Gently tap or roll the eggs to make cracks, but leave the shell on. Actually, this reminds me: if you go to any 7-11 in Taiwan, they’ll have a rice cooker/steamer keeping tea eggs warm for sale. Delish! Uh… wow. Hahaha! I like em cool or warm. Could you just reboil it? HAHAHA pol!!! Yeah 7-11 in Taiwan is full of cool stuff, way better than the 7-11’s here. LOL.. same thing happened to me. Except I was using normal eggs and I DID peel them.. so peeling them is NOT the solution. Apparently, you aren’t supposed to microwave hardboiled eggs at all. haha! we tried the same once, only it was with an uncooked egg, and we were trying to cook it. However I vaguely remembered that you’re not meant to microwave eggs, so we put a pirex jug on top of it to catch it if it did explode…. BAD IDEA!!! after a few mins the egg and the jug exploded, sending egg and glass flying all over the kitchen lol!! But I didn’t know Pyrex exploded! I always thought Pyrex was practically unbreakable. Dude, that’s crazy. 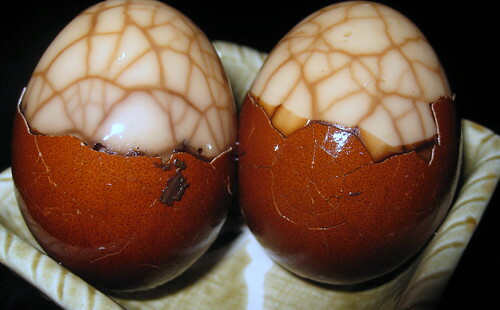 OK, I’m going to try these amazing looking Eggs out on my husband (Guinea Pig!). I just wanted you to know that your story is Hilarious. I will cut them in half after peeling then Nuke them for a few seconds. Thanks! How come no-one has made a Eggsploding pun?